On our trip to the village we brought along the equipment to show the JESUS film and some HIV/AIDS dvds. (HIV/AIDS is becoming a big problem in PNG). 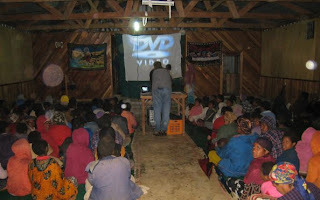 On 5 evenings we went out to different villages to show movies, each time in a local church, like the one above. 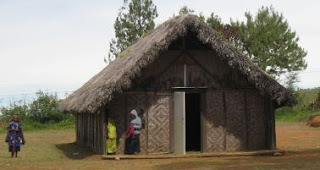 Sometimes it was a thatched roof church with straw or pine needles on the floor. Other times it was a tin-roofed church with concrete and maybe even wooden benches. It was always packed. The best experience that I had was on our 4th trip, when we visited a village that was a little more remote and where they hadn’t seen any of the films before. 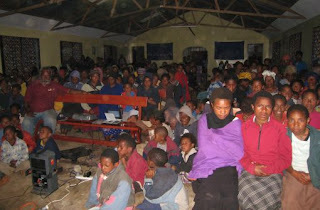 It was a drizzly evening, but when we arrived the church was already packed with people. As we were setting up the generator and projector, people kept coming in and somehow they seemed to find places to sit. But there wasn’t room for everyone, so we ended up stringing up the white sheet that served as our screen over the doorway of the church, so that the people who were willing to stand up outside with umbrellas could watch the movie from the back side, albeit a mirror image. By the time we were ready to begin, there was no place left for Brian and I. Brian wedged himself into a corner where he couldn’t see anything and his leg got so numb he couldn’t move it. I ended up sitting next to the doorway, my back to the wall and facing the crowd. Although I couldn’t see the screen, it was really neat to watch the faces of the spectators. There was one little boy in the front row whose mouth hung open the whole time as he took everything in with wide eyes. People jumped when they saw the snake representing Satan. They smiled when they saw the baby Jesus. And they almost cheered out loud the first time they saw the face of grown-up Jesus. They laughed when Peter, James and John caught a miraculous catch of fish. And they cried and hid their faces during the crucifixion scene. And through it all was a constant chorus of tsk tsk tsk sounds – they typical Papua New Guinean response to anything wonderful, amazing, tragic, or anything inbetween. I’ve been in PNG long enough to know that the Tok Pisin in the film is sometimes stilted and unnatural sounding, but no one cared. Neither did they care that the film was dated and lacked flashy special effects. They were completely enthralled and moved by a film that would have bored most Americans. It was refreshing to see. What a sweet story of your time in the villages - I'm sorry Brian's leg fell asleep, but what a blessing for you Susan, to watch the faces of the crowd as they took the movie in.